Of course he's not the first president the arch hawk has convinced to ditch a nuke treaty. 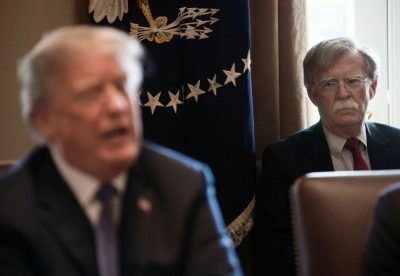 Trump appears to have surrendered to the anti-arms control philosophy of John Bolton, who views such agreements as unduly restricting American power. (Bolton was also behind the 2001 decision by President George W. Bush to withdraw from the 1972 Anti-Ballistic Missile Treaty, an act the Russians viewed as inherently destabilizing.) By involving China, which was not a signatory to the INF Treaty, into the mix, the president appears to be engaging in a crude negotiating gambit designed to shore up a weak case for leaving the 1987 arms control agreement by playing on previous Russian sensitivities about Chinese nuclear capabilities. Although unspoken, both Bolton and Trump appear to be trying to drive a wedge between Russia and China. They’re doing so as those two nations are coming together to craft a joint response to what they view as American overreach on trade and international security. While the Russian concerns over Chinese INF capabilities might have held true a decade ago, that doesn’t seem to be the case any longer. “The Chinese missile program is not related to the INF problem,” Konstantin Sivkov, a member of the Russian Academy of Missile and Ammunition Sciences, recently observed. “China has always had medium-range missiles, because it did not enter into a bilateral treaty with the United States on medium and shorter-range missiles.” America’s speculations about Chinese missiles are “just an excuse” to withdraw from the INF Treaty, the Russian arms control expert charged. Moreover, China doesn’t seem to be taking the bait. Yang Chengjun, a Chinese missile expert, observed that the U.S. decision to withdraw from the INF Treaty would have a “negative” impact on China’s national security, noting that Beijing “would have to push ahead with the modest development of medium-range missiles” in response. These weapons would be fielded to counter any American build-up in the region, and as such would not necessarily be seen by Russia as representing a threat. Any student of the INF Treaty knows that the issue of Russia’s national security posture vis-à-vis China was understood fully when the then-USSR signed on to the agreement. During the negotiations surrounding INF in the 1970s and 1980s, the Soviets had sought to retain an INF capability in Asia as part of its Chinese deterrence posture. Indeed, the Soviet insistence on keeping such a force was one of the main reasons behind the “zero option” put forward by the U.S. in 1982, where a total ban on INF-capable weapons was proposed. The U.S. knew that the total elimination of INF systems was a poison pill that Russia simply would not swallow, thereby dooming future negotiations. Mikhail Gorbachev turned the tables on the Americans in 1986, when he embraced the “zero option” and called upon the U.S. to enter into an agreement that banned INF-capable weapons. For the Soviet Union, eliminating the threat to its national security posed by American INF weapons based in Europe was far more important than retaining a limited nuclear deterrence option against China. The deployment of Pershing II missiles to Europe in the fall of 1983 left the Soviet leadership concerned that the U.S. was seeking to acquire a viable nuclear first-strike capability against the Soviet Union. The Soviets increased their intelligence collection efforts against U.S. targets to be able to detect in advance any U.S./NATO first-strike attack, as well as a “launch on detection” plan to counter any such attack. In November 1983, when the U.S. conducted a full-scale rehearsal for nuclear war in Europe, code-named Able Archer 83, Soviet intelligence interpreted the exercise preparations for the real thing. As a result, Soviet strategic nuclear forces were put on full alert, needing only an order from then-general secretary Yuri Andropov to launch. The Soviet system had just undergone a stress test of sorts in September 1983, when malfunctioning early warning satellites indicated that the U.S. had launched five Minuteman 3 Intercontinental missiles toward the Soviet Union. Only the actions of the Soviet duty officer, who correctly identified the warning as a false alarm, prevented a possible nuclear retaliatory strike. A similar false alarm, this time in 1995, underscored the danger of hair-trigger alert status when it comes to nuclear weapons—the launch of a Norwegian research rocket was interpreted by Russian radar technicians as being a solo U.S. nuclear missile intended to disrupt Russian defenses by means of an electromagnetic pulse generated by a nuclear air burst. Russia’s president at the time, Boris Yeltsin, ordered the Russian nuclear codes to be prepared for an immediate Russian counter-strike, and was on the verge of ordering the launch when Russian analysts determined the real purpose of the rocket, and the crisis passed. The Europeans had initially balked at the idea of deploying American INF weapons on their territory, fearful that the weapons would be little more than targets for a Soviet nuclear attack, resulting in the destruction of Europe while the United States remained unharmed. To alleviate European concerns, the U.S. agreed to integrate its INF systems with its overall strategic nuclear deterrence posture, meaning that the employment of INF nuclear weapons would trigger an automatic strategic nuclear response. This approach was designed to increase the deterrence value of the INF weapons, since there would be no “localized” nuclear war. But it also meant that given the reduced flight times associated with European-based INF systems, each side would be on a hair-trigger alert, with little or no margin for error. It was the suicidal nature of this arrangement that helped propel Gorbachev and President Ronald Reagan to sign the INF Treaty on December 8, 1987. This history seems to be lost on both Trump and Bolton. Moreover, the recent deployment of the Mk-41 Universal Launch System, also known as Aegis Ashore, in Romania and Poland as part of a NATO ballistic missile shield only increases the danger of inadvertent conflict. Currently configured to fire the SM-3 surface-to-air missile, the Mk-41 is also capable of firing Tomahawk cruise missiles which, if launched in a ground configuration, would represent a violation of the INF Treaty. The U.S. Congress has authorized $58 billion in FY 2018 to fund development of an INF system, the leading candidate for which is a converted Tomahawk. “We’ll have to develop those weapons,” Trump noted when he announced his decision to leave the INF Treaty, adding “we have a tremendous amount of money to play with our military.” Nuclear deterrence isn’t a game—it is, as Putin noted, a matter of life and death, where one split second miscalculation can destroy entire nations, if not the world. One can only hope that the one-time real estate mogul turned president can figure this out before it is too late; declaring bankruptcy in nuclear conflict is not an option.